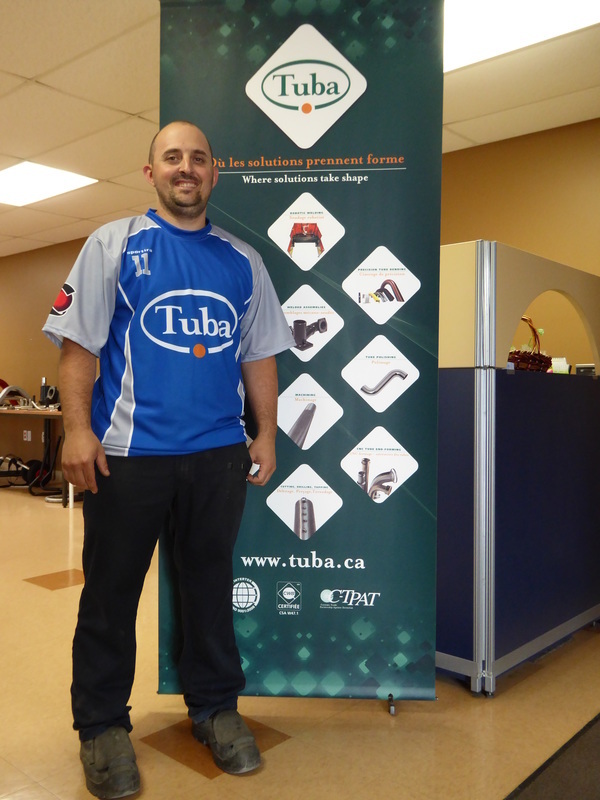 St-Pie-June 1, 2016, Despite the known hazards of the manufacturing sector, TUBA announces expansion of 60% therfore adding up 12,080 square feet to its production area. Taking advantage of increased demand from its customers, and always willing to support their growth, TUBA opens the machine and it is only the A phase of the operation with an initial investment of $ 1M. The Conference Board of Canada recently released its report, stating that "While many manufacturing industries are operating at full capacity, entrepreneurs are reluctant to invest" Tuba is certainly not part of these statistics. ​Guy Côté, President: "Since 2008, we are all aware that industrial subcontracting has suffered ups and downs, for all sorts of reasons, but our customers are loyal and as such, the actual work of a subcontractor is to support and especially anticipate the needs of its clients, what we do and they appreciate. To have a supplier who is ready for any eventuality, should a rapid growth of production happen is certainly an added value in our industry right now, and that is what we are ". This expansion will increase its total area to 38,880 square feet and will be able to accommodate the new equipment recently purchased among others, cranes with a lifting capacity of 5 tons. The remodeled floor will also ensure greater fluidity to the production areas. TUBA is a specialized manufacturer since 1993 in the metal fabricating and more specifically in the precision tube bending and assembly of welded parts, both for steel and aluminum. Tuba operates exclusively in the context of subcontracting for short and medium production runs. "We are confident that this good news which will delight our existing customers and potential customers for who advanced technologies and respect for values ​​and timelines are a priority," concluded Guy Côté, President. 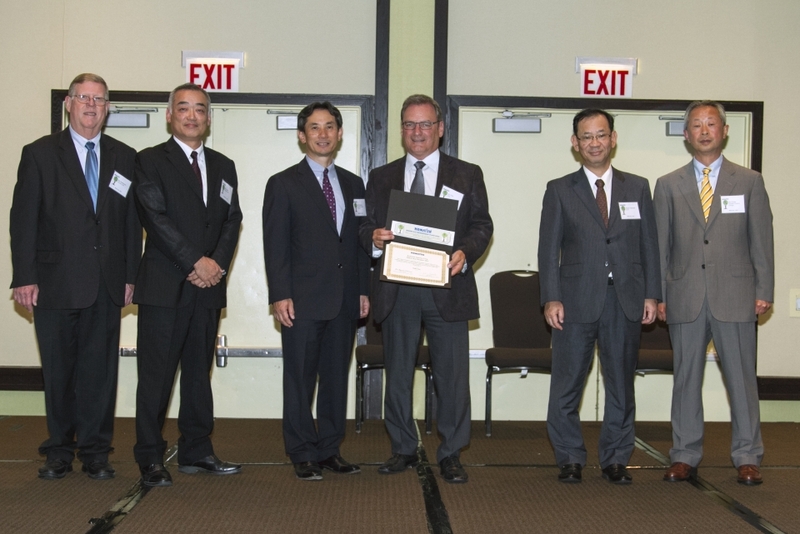 "Congratulations Guy Côté, CEO Tuba also Exhibitor in our Transport Virtual Trade Show"
Last July 14th TUBA and its CEO Guy Côté, while in Chicago, received the official MIDORI-KAI supplier elite certification for 2015. 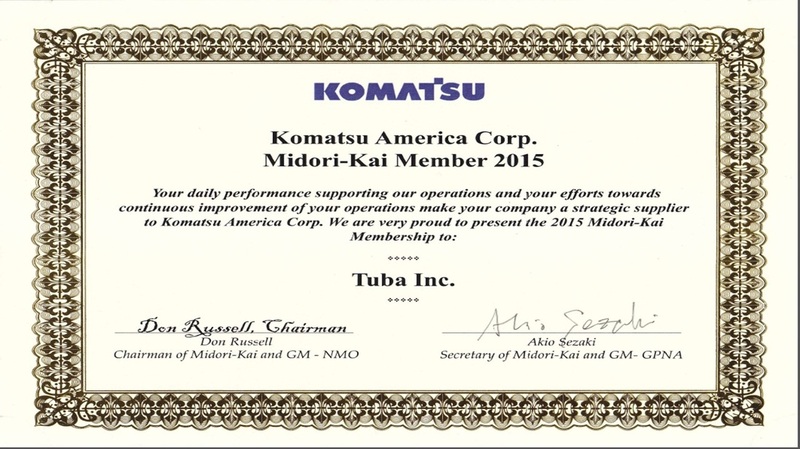 This great recognition was given by Komatsu, to confirm the great performance offered byTUBA as a supplier. This is great recognition of performance, also with delivery time, reaching Komatsu’s requirements like a 100% mark for their suppliers. In 1993, Guy Côté took over the bankrupt company to focus its activities on the specific niche market of precision bending and thus specialize in the bending of three-dimensional metal structures. In its facilities located in Saint-Pie, Tuba manufactures parts, which range from simple footrests to bumpers to components for bus chassis frames, on behalf of its transportation industry clients. And so, Tuba created an internal training program for employees to make sure that the knowledge of the senior staff is passed on to its new machinists and welders. “When people leave, knowledge leaves with them. We were concerned about losing that knowledge,” he added. Created more than 10 years ago with a human resources specialist, the program has proven to be beneficial. But the President of Tuba seized an opportunity to update the program recently. Contacted by Parcours Formation, a competency development centre targeting companies and run by the Saint-Hyacinthe School Board, Guy Côté took part in a pilot project which involved transferring his paper-based training program onto a tablet. The project was managed by Parcours Formation in association with the Centre facilitant la recherche et l’innovation dans les organisations (CEFRIO). This new tool also helps current employees learn to operate tools that they never dared to before. Guy Côté sees this as a bonus since Tuba is called upon to manufacture parts in small- and medium-size runs, and therefore needs its employees to be versatile. « On a vraiment poussé notre programme de formation d’un cran », dit Guy côté, enthousiaste au possible. Tuba Buys a New Machine! We recently bought an E-TURN35 from BLM Group. It’s a new high-precision, fully electric bending machine. http://www.blmgroup.com/. Since 1993, we specialize as an exclusive subcontracting manufacturer of precision bending and mechanicaly welded assemblies for short and medium production runs. Our site has been optimized for the most recent versions of Internet Explorer, Chrome, Firefox and Safari. A version of our site is available for IOS and Android devices.